I had a brilliant moment a few days ago and I know I’m not inventing the wheel here, but I had to share. Lil’s cousins Brock and Bryce were visiting and they had just got back from the park with my In-laws. The kids were hot and wanted a snack. 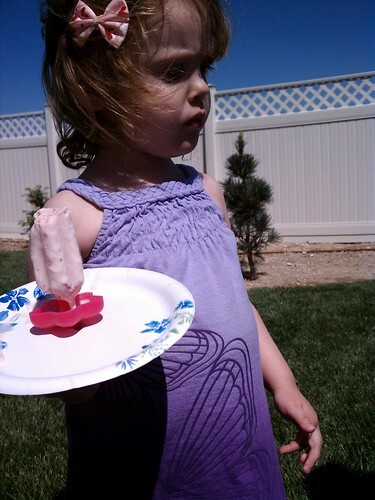 I had made Lil some strawberry banana surprise Popsicles a few days before so I gave each of them one and we all went out to the backyard to keep the mess down. Brock was sitting on a sheet with my Mother in Law when he started complaining that he didn’t like how the popsicle juice was getting on his arm. I had a flash of brilliance, I went inside and grabbed 3 small paper plates from the pantry and made a slit in the middle with a sharp paring knife. 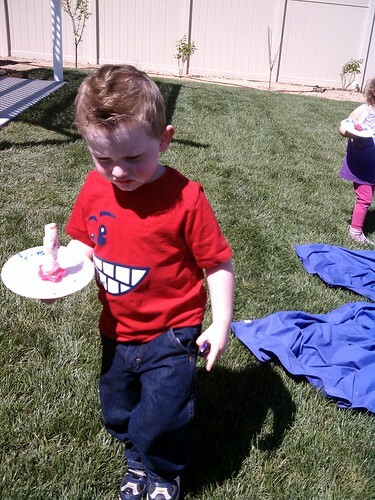 I went outside, asked Brock for his popsicle and popped it in the slit. He was thrilled. My Mother in Law was amazed and I was pretty darn happy since cleanup just got a lot easier. 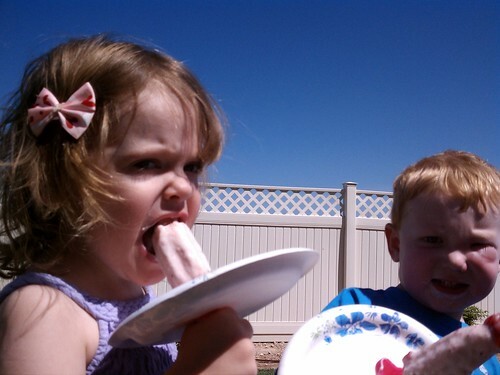 I put Lily and Bryce’s popsicles on a plate too and everyone was happy. Like I said I didn’t invent this, I have seen people put candles through paper plates for vigils and I’ve seen ear candles the same way. I just haven’t seen popsicles like this before. With Summer and the hot weather coming up I thought some people might find this useful. Oh and the Strawberry and banana surprise popsicles couldn’t be easier to make. I put a banana in my small food processor along with some sliced up strawberries. Once it was all chopped up I added some plain yogurt and a splash of orange juice. Pulsed it again to mix it together and spooned it into my new popsicle molds. I highly recommend the molds by the way, they are super sturdy and way cute. This entry was posted in Food, Friends and family, Fun, Life, Lily and tagged food, Friends and family, Lil.